Junkers Ju 52/3mg5e floatplane. Note the additional gun position in the top of the cockpit; the gunner standing in between the pilots. Fairly widely recognised as the world’s most efficient national airline at the end of the 1920s (while others struggled to survive the great depression), Deutsche Lufthansa flew highly competitive services throughout Europe using a heterogeneous fleet of aircraft largely comprising designs progressively developed from Professor Hugo Junkers’ original J 1 all-metal monoplane of 1915. The great majority of these early aircraft (the J 10, F 13, A 20, F 24, W 33, W 34, Ju 46 and Ju 52) were single-engined, low-wing monoplanes, but in 1924 there appeared a three-engined airliner, the G 23, powered by a 195 hp (145 kW) Junkers L.2 and two 100 hp (75 kW) Mercedes engines. It is thought that, as a result of Versailles Treaty restrictions imposed on German aircraft manufacture, this prototype was produced at Junkers’ Fili factory near Moscow with production of about nine aircraft (as well as that of the much more numerous G 24) was subsequently undertaken in Sweden. The G 24, usually powered by three (280/310 hp) (209/231 kW) Junkers L.5 inline engines, served in numerous configurations and with a number of airlines, including Lufthansa, which retained them in service until 1933-34. 1926 was a busy year for the Junkers concern, with two new designs (the G 31 tri-motor transport and the W 33/34) being the most important to fly. The former was a beefier version of the successful G 24, and the latter an excellent single-engined transport which was built in large numbers. Almost at once, the Junkers designers embarked on a new but considerably enlarged single-engined transport, the Ju 52, which embodied the cumulative experience of earlier designs and was primarily intended for freight carrying. Like its predecessors, it was of standard Junkers all-metal construction with corrugated, load-sustaining duralumin skinning, and featured the patented Junkers full-span double wing. Five aircraft were built, of which four underwent development with various powerplants in Germany and one (CF-ARM) went to Canada. The original Ju 52 Ju 52 started life as a single-engine aircraft, designed as a cargo transport and having a 590 cubic ft (16.7 cubic m) cabin capable of accommodating a 4,067 lbs (1845 kg) payload. The first Ju 52ba prototype (D-1974) flew on 13 October 1930 powered by an 800 hp (597 kW) Junkers L.88 engine. Extensive flight testing was carried out before the prototype was re-engined with a 755 hp (563 kW) BMW VIIau engine, in which form it was redesignated Ju 52be. The second prototype was tested with several engines, including the 755 hp (563 kW) BMW VII (Ju 52de), the 750 hp (559 kW) Armstrong Siddeley Leopard radial (Ju 52di) and finally the 750 hp (559 kW) Junkers Jumo 204 diesel (Ju 52do). Despite its single engine, the Ju 52 was able to carry 15-17 passengers when required. Production deliveries began with the third aircraft, but only six single-engine Ju 52s were built before the company decided to evaluate a three-engine configuration. The Junkers design team, under Dipl Ing Ernst Zindel, undertook work to adapt the airframe of what would have been the seventh Ju 52. It was converted to take three 550 hp (410 kW) Pratt & Whitney Hornet 9 cylinder radial engines, becoming designated Ju 52/3mce. When first flown in April 1931 it was such a success that the single-engine version was discontinued in favour of the Ju 52/3m (Dreimotoren, or three motor). The first customer was Lloyd Aereo Boliviano which received a total of seven Ju 52/3mde aircraft beginning in 1932. Subsequent deliveries were made to Finland, Sweden and Brazil, as well as to Deutsche Lufthansa. Ultimately, Ju 52/3ms flew with airlines in Argentina, Austria, Australia, Belgium, Bolivia, China, Colombia, Czechoslovakia, Denmark, Ecuador, Estonia, France, Great Britain, Greece, Hungary, Italy, Lebanon, Mozambique, Norway, Peru, Poland, Portugal, Romania, South Africa, Spain, Switzerland, Turkey and Uruguay. Powerplants included Hispano-Suiza, BMW, Junkers Jumo, Bristol Pegasus, Pratt & Whitney Hornet and Wasp engines. Commercial Ju 52/3ms delivered to Bolivia were employed as milita transports towards the end of the Gran Chaco war of 1932-35. From late in 1932, Ju 52/3ms were delivered to Lufthansa, with D-2201 ‘Boelcke’ and D-2202 ‘Richthofen’ inaugurating the airline’s Berlin-London and Berlin-Rome services before the end of that year. In due course, no fewer than 230 Ju 52/3ms were registered with Deutsche Lufthansa, continuing to fly commercial services to Spain, Portugal, Sweden, Switzerland and Turkey almost to the end World War II. Like its predecessor, the Ju 52/3m could operate also on skis or floats, and orders were placed by Sweden’s AB Aerotransport and Finland’s Aero O/Y for floatplane versions. Wheel landing gear was fitted to the otherwise similar Ju 52/3mce aircraft ordered by Deutsche Lufthansa for delivery from the spring of 1932, and it was with this airline that the type began to make a name for itself. Contemporary Lufthansa records quote the price as Reichsmarks 275,000, and with 15-17 passengers on board the Junkers had a cruising speed of 132 mph (212 km/h). Large fixed flaps running the whole length of the wing trailing edge cut the landing speed to 59 mph (95 km/h), enabling the Ju 52/3m to use small airfields, a factor particularly useful to airlines operating in South America. An oxygen supply system was monitored by the radio operator and could be switched on at passengers’ request. Production of the Ju 52/3m built up quickly and by the end of 1935, 97 were in service with a number of airlines, including 51 with Lufthansa. Meanwhile, the military potential of the type was being examined by the clandestine Luftwaffe, who considered ordering it as a stop-gap until Dornier Do 11 bombers were delivered. Problems with the latter could not be satisfactorily overcome, however, so orders were placed for Ju 52/3mge aircraft with three BMW 132A-1 (license built Pratt & Whitney Hornets) radial engines rated at 660 hp (492 kW) each and later for the improved Ju 52/3mg3e machines with 725 hp (541 kW) BMW 132A-3 engines and other improvements. Bomb-release mechanism was installed in three bomb bays, such an arrangement being necessary because the wing centre-section and main spars did not permit a single bay. It was also necessary to develop vertical bomb storage magazines since space between the spars did not allow horizontal stowage. A fairing containing a bomb-aiming device, fuse-setting mechanism and release lever was fitted below the fuselage, and hinged to the fairing was a retractable ‘dustbin’ installation for a machine-gun, which could be winched up into the fuselage for take-off and landing. The military model also had two additional fuel tanks in the wings, plus an improved fuel-jettison system, which when experience proved that the latter was never used it was later removed. The Ju 52/3m had its first taste of military action when 20 Luftwaffe aircraft were flown to Seville in 1936 to support the Nationalist forces in the Spanish Civil War. They were used in a ferrying role, bringing back 10,000 Moorish troops from Morocco to Spain. At the end of the year a special air force, the Legion Condor, was formed, comprising Luftwaffe personnel and aircraft operating in Spanish Nationalist uniforms and markings. The Ju 52s were employed as bombers until replaced a year later by Do 17s and He 111s. Their final operation was flown in March 1939, and the Ju 52 had flown throughout the Civil War, amassing some 13,000 operational hours and dropping more than 6,000 tons of bombs. Only eight were lost, five being shot down and the others destroyed on the ground. The type had proved its reliability in action and was blooded for the greater conflict about to begin. Meanwhile, Ju 52/3ms were continuing in production for civil airlines, with whom the type remained in service until after the end of World War II. More than 230 were registered to Lufthansa, although some were no doubt passed on to other customers, including the Luftwaffe. In the period 1934-5, 450 were delivered to the Luftwaffe, and in 1939 that force received 593. It is of interest to note that three Ju 52/3mg4e aircraft were delivered to the Swiss air force for transport work, and two of these were still on active strength until 1981 (with the third preserved for a museum) when they were finally retired. The two aircraft continue to fly giving sight-seeing tours around Europe. 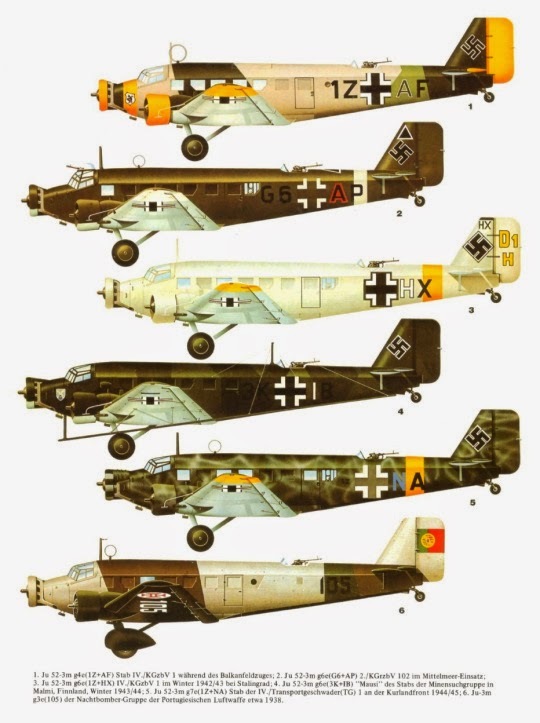 With the outbreak of World War II in 1939, the Luftwaffe took over 59 of Lufthansa’s fleet of Ju 52/3ms and the type was used extensively in airborne assault operations and supply missions. As German troops moved across Europe, overrunning Denmark, Norway, Belgium, the Netherlands and France, the Ju 52/3m was seen in ever increasing numbers in supply and paratrooping roles. At the beginning of the Norwegian operation 571 Ju 52/3m transports were available in addition to other types, being used on 9 April 1940 in the Luftwaffe’s first major airborne operation. After Norway had been occupied, a second major airborne assault began against the Low Countries, on 10 May 1940. Once again the Ju 52/3m was in the thick of operations, with 430 aircraft, but this time much stiffer opposition was encountered and almost 40 per cent of the transports were lost. A total of 162 Ju 52/3m transports was shot down, although some of these were repaired later as German land forces moved forward and captured the battle zones. With the greater percentage of the west coast of Europe in Axis hands the British stepped up their offensive against German shipping, many mines being laid in coastal waters at the entrance to estuaries and rivers along much of the occupied coast. In a bid to help counter this a number of minesweeping groups were formed with specially adapted Ju 52/3m(MS) aircraft. These had large dural rings fitted beneath the fuselage and braced below the engines, the hoops energized by an auxiliary motor in the fuselage to deal with magnetic mines. Other Ju 52/3m aircraft each carried a container with small explosive charges to detonate other types of mines. It was the practice to fly in groups of three aircraft at about 124 mph (200 km/h), with the altitude some 130 ft (40 m) above the estimated level of the mine. While effective in this role, it was extremely hazardous to both plane and crew. 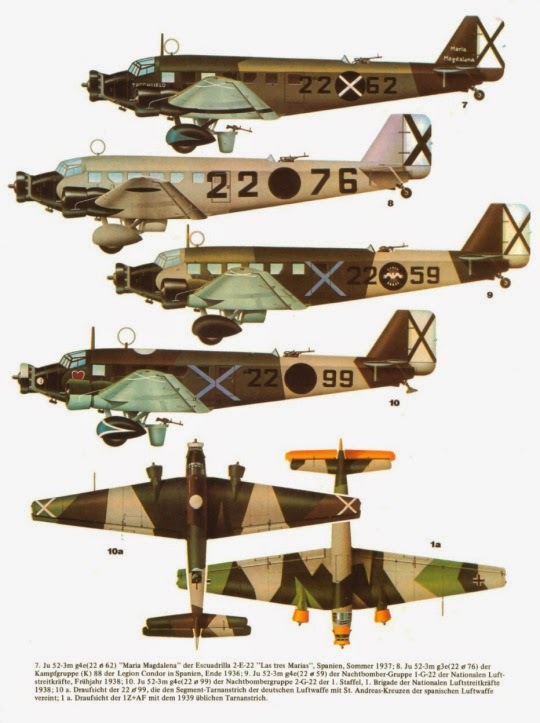 Nine subsequent military versions with progressive improvements included the Ju 52/3mg4e with internal equipment changes and a tailwheel replacing the tailskid, which was followed by the considerably improved Ju 52/3mg5e that introduced 830 hp (619 kW) BMW 132T engines, exhaust heat for de-icing, interchangeable wheel, float or ski landing gear and more advanced radio equipment. The similar J u 52/3mg6e had wheeled landing gear as standard, and simplified radio, the Ju 52/3mg7e added an autopilot and a large loading hatch plus, in the similar Ju 52/3mg8e, an additional cabin roof hatch. Late-production examples of this last aircraft introduced improved BMW 132Z engines. In early production form the Ju 52/3mg9e was almost identical, but late construction had strengthened landing gear and glider towing equipment as standard, as did the Ju 52/3mg10e which differed only by being capable of float operations. Penultimate variant was the Ju 52/3mg12e which introduced BMW 132L powerplant, some of these production aircraft being completed to airline standards and supplied to Lufthansa under the designation Ju 52/3m12. Final version was the Ju 52/3mg14e, similar to late production examples of the Ju 52/3mg9e, but with improved armour protection for the pilot and heavier defensive armament. The virtual failure of the Italian campaign against Greece and Yugoslavia, together with the build-up of British forces on Crete, made it necessary for Germany to take action in the Balkans, and on 20 May 1941 Operation ‘Mercury’ began. It was the Luftwaffe’s greatest airborne assault and involved the landing of 22,750 men and their supplies on Crete. Of these, 10,000 were parachuted in, 750 were carried in 80 DFS 230 gliders, 5,000 were landed by Ju 52/3m, and 7,000 were seaborne. The attack took place in two waves, and 493 Ju 52/3m transports were used. Stiff resistance was encountered from Allied troops that included Australians and New Zealanders, and although the Luftwaffe had complete air superiority the German losses were heavy, with 4,500 men lost and 271 Ju 52/3m transports destroyed or seriously damaged. This was the last mission on which German paratroops were employed in large numbers in the airborne role. The Ju 52/3m force also received severe mauling at the hands of the RAF during 1942-3 when it attempted to relieve German forces operating in North Africa, the biggest single loss occurring on 18 April 1943 when 52 Junkers from about 100 were shot down near Cape Bon. Ju 52/3m aircraft were also operating on the Eastern Front in the USSR and suffering heavy losses; in 1941 these exceeded production, with 451 being delivered and more than 500 lost. This high casualty rate demanded action, and a new production line was laid down at the Amiot factory at Colombes, with arrangements being made with a number of sub-contractors in the Paris area. The first French-assembled aircraft was accepted in June 1942 with 40 more being delivered in the next six months, and 321 in the following year. When German forces were surrounded at Stalingrad in 1942-3, an attempt was made to fly in supplies, but the Luftwaffe lost 490 transports, of which 266 were Ju 52/3m transports. Assembly of the Ju 52/3m was arranged with PIRT (Pestszentlörinc Ipari Telepek or Pestszentlörinc Industrial Workshops) in Budapest from German-supplied components, and the first of 26 was completed in January 1944. The Luftwaffe received four and the balance went to the Hungarian air force. Production of the Ju 52/3m ended in Germany in mid-1944, and while figures vary it seems likely that the total number built in Germany and France from 1932 until 1944 was 4,845. Post-war, the French built more than 400 for Air France and their air force, by which the type was designated AAC.1. CASA (Construcciones Aeronáuticas S.A.) built 170 in Spain for the air force under the designation CASA 352, and it is largely these aircraft, surplus to Spanish military requirements, that have begun to appear in museums and private collections. Ten aircraft were reconditioned by Short Bros and Harland in Belfast, and entered service on 18 November 1946 with British European Airways as (G-AHOC) and (G-AHOL) on the Croydon-Liverpool-Belfast service. Called “Tante Ju” (Aunt Ju) by the Germans, but also known unofficially by the Allies as “Iron Annie” or the “Corrugated Coffin”, The Ju 52/3m was an extremely rugged and reliable aircraft. The backbone of the Luftwaffe transport units, its service life extended well beyond the end of the war. Seven aircraft are still airworthy today. (D-AQUI) of Lufthansa, three of Ju-Air in Switzerland (with one more flyable but static in a museum) and (Zs-depr) of South African Airways, (N352JU) of the Confederate Air Force and (CG-ARM) of the Western Canada Aviation Museum which also fly a single engine (CF-ARM) Ju 52/1m. One more is currently in the final stages of assembly in Portugal, after restoration in Norway. Not a bad record for an aircraft over 70 years old. When fitted with seats, the Ju 52/3m could carry up to 18 passengers, with two rows of single seats separated by a single aisle. By removing the seats, the cabin could hold a surprising amount of cargo. Entry to the cabin was made through a door on the port side. This could be opened in flight to permit para-dropping of either supplies or troops. On the starboard side was a large cargo loading door, with upward and downward-hinging flaps. The space behind the cabin door was often used for cargo storage or provided the stand for the gunner. Behind the gunner, an inspection tunnel with reinforced floor-way provided access to the control linkages under the tail. The Ju 52 was originally envisaged as a bomber/transport, carrying weapons in two internal bays. As such, it was used during the Spanish Civil War, while transport Ju 52/3ms were later used as bombers by the French in Indo-China. World War II Luftwaffe use was largely restricted to the transport role, but until 1943 the Ju 52 units retained their KGrzbV appellation, this standing for Kampfgruppe zur besondern Verwendung, or ‘bomber wing for special purposes’. The large aerial above the cockpit was a mast for the single wire aerial which ran to the tail. Behind it, a loop aerial served the direction-finding equipment. 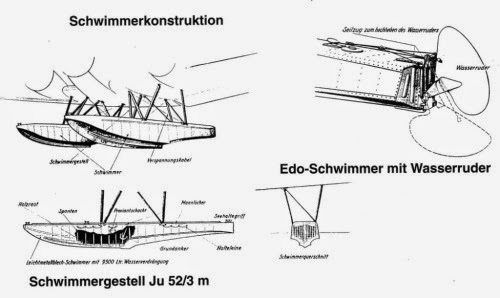 A feature of Junkers designs of the period was the detached flap/aileron assembly positioned below and behind the main wing structure. The ailerons drooped at low speed to act as partial flaps which, together with the normal slotted inboard flaps, gave the type tremendous STOL capability. The entire wing could be detached from the fuselage and was attached by eight ball-and-socket joints. Both tail and tailplane were built, like the wing, on a multi-spar structure. The elevators (and ailerons) featured distinctive balancing horns to lighten control forces. The Ju 52/3m had a fixed undercarriage of immense strength, although its narrow track made it prone to bouncing from side to side. The 3mg5e version had provisions for wheel, ski or even float undercarriage to match the operational environment in which it found itself. Early Ju 52/3ms had a tailskid but, due to the poor nature of Germany’s military airfields, a tailwheel was introduced from the 3mg4e onwards. This greatly improved manoeuvrability on the ground. The Ju 52/3m was factory-fitted with large spats to streamline the mainwheels, but in the operational environment most of these were removed, as they rapidly clogged with sand or mud. The Ju 52/3mg5e was powered by a trio of closely cowled 830 hp (619 kW) BMW 132T-2 9-cylinder air-cooled radial engines. The two outboard engines were ‘toed-out’, or in other words, were set at an angle to the main thrust line. This reduced the considerable yaw if one of the wing engines was lost, by pulling the aircraft away from the dead engine. The nacelles housed the engine oil tanks above the wing leading edge. Filler caps above them served the oil (forward) and fuel (rear) tanks. The fuel was held in wing tanks, positioned inboard of the engines. Exhaust gas from the engines was collected by annular ducts and ejected below and to the sides of each engine. These caused characteristic stains on the fuselage and wings, but kept the filler caps and cockpit area clean. The 3mg5e introduced exhaust de-icing. Construction: Built initially as an airliner, then series production for the Luftwaffe; the last wartime deliveries being made in mid-1944. Also built by Amiot in France from 1941. Post-war Amiot built 415 as the AAC. 1 Toucan, and CASA in Spain built 166 CASA 352s up to the mid-1950s. Total production came to just over 5,400 units. First Flight: October 13, 1930 as a single-engined transport, powered by an 800hp (596kW) Junkers L88 12-cylinder `vee’ piston engine. Redesigned, it first flew in its three-engined format in April 1932 – hence the /3mg (tri-motor) suffix to the designation. Powerplant: Three 725hp (540kW) BMW 132A-3 radial piston engines. Dimensions: Span 95ft 111/2in (29.24m) Length 62ft 0in (18.89m) Height 18ft 21/2in (5.54m) Wing area 1,189ft2 (110.45m2). Weights: Empty 12,610lb (5,719kg) Max all-up 23,146lb (10,499kg). Performance: Max speed 165mph (265km/h) at sea level. Service ceiling 19,360ft (5,900m) Typical range 620 miles (997km). Armament: Bomber mode: One 7.9mm machine-gin in dorsal position, one 7.9mm machine-gun in semi-retractable ventral `dustbin’ turret. Up to 1,100lb (498kg) of bombs. Transport role: One 7.9mm machine-gin in dorsal position. Crew: Four/Five. Accommodation for up to 24 paratroops.